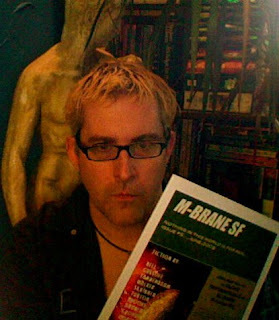 I've made all the issues of M-Brane from issue #3 to present available for print-on-demand by way of Lulu, and after issue #3 was released, I went back and fixed some problems in the source documents for issues #1 and #2 so that they could be available there as well. I had not until yesterday, however, actually seen one of these print copies with my own eyes. I received a couple copies of the newest issue, M-Brane #5, yesterday and I am delighted with what a nice job Lulu does of printing and binding it. The interior lacks the spot color that PDF version has, and the ads are rendered in black and white, but the print quality is excellent, and much cleaner-looking than one gets by running something off at FedEx like I did for the original print versions of #1 and #2. Also, it is perfect-bound (like a normal paperback book) and the cover is absolutely beautiful, printed in full color on heavy glossy stock. Writer Robert Keller, who has a story scheduled in a future issue, made a good suggestion to me the other day. While I am happy to have this print version (and the Kindle version) available for people like Robert who like to get it that way, these third-party methods don't net M-Brane a whole lot of income since Lulu and Amazon get nearly the whole take. And that's fine: if we start selling a lot more of them, it will still add up to some extra money over time. But Robert suggested that since the PDF version is still the best source of income for the magazine (at least until ads start selling better), I might want to make that edition somehow different, with some bonus content not present in the other formats. I am considering it but haven't decided what or how yet. As readers who have followed the zine and this blog from the beginning know, I have been working constantly on finding new ways to generate income and move us along toward the ultimate goal of being a pro publication. The frustrating puzzle that still defies solution, however is this: readers have not yet made the mental shift in large enough numbers to thinking that an electronic publication is something (and therefore worth money), while there seems to still be the persistent sense that something in print carries a lot more intrinsic value. That would be fine with me, but not many people are buying the print version anyway--actually more than I thought would have, but still not in huge numbers yet. Where we are at now seems to be this: enthusiasm for spending a lot of money on print periodicals is well into decline (note all the newspaper and magazine failures that have happened lately or are about to happen), and everyone wants free electronic versions instead. Believe me, I would love to make M-Brane free to the world every month, but it's not going to happen until/if it has some kind of other major funding source. I have no means of paying the little bit that I pay to the writers--and certainly no hope of increasing those payments--without income from subscriptions, single-copy sales, ads or donations. It must fund itself. The other option would be to not pay writers at all (thus eliminating a large portion of the zine's direct costs of doing business) but that would be totally counter-productive to my long-term goals and make it impossible for me to get content of the quality that I have had so far. Though I don't pay much, it is something, and that little something gets me stories from a lot of writers who would never consider sending me anything if I were a non-paying market. I think in a few years when there just aren't any more major print periodicals left in the market, this sort of problem will solve itself. I'll navigate as best as I can in the meantime. I am not going to drop my basic insistence, however, that writers' work needs to be compensated somehow and that means ipso facto that readers need to shell out at least a little bit. Another possibility that seems increasingly promising is that I may be able prop up the zine's funding by expanding the operation into some other areas such as books. The queer anthology for which I am currently reading, is intended to be a first experiment in creating a product that can generate a profit (even selling by way of third parties) and possibly reach a wider audience than the monthly zine usually does. If this goes according to plan, then I will be devising some other projects, possibly other kinds of anthologies or maybe single-author collections. Wow, there's a lot to think about in this article. I must commend you on getting this far and can only hope that you receive more subscriptions etc as I would like to see this magazine be more successful. Good luck with the other projects in the pipeline, my friend. I think this post at the Save the Semiprozine Hugo site is worth checking out in reference to your post: http://savesemiprozine.org/2009/06/03/john-klima/ . Partnering with a small publisher like Klima did with Nightshade books could be a great deal. Getting into bookstores, even if just comic book stores and specialty shops to start with. Think up a good deal, create a flyer with info/ order form, and draft your contributers to scour their local specialty shops. I've other non-semiprozines in Hastings and Borders, so it is possible. Ask Kaolin or some of the other Gud people how they did it. I'm sure I've seen then in one of the bookstores. Space and Time, LCRW, Black Gate: all perfect-bound, non-semipro mags that are on the book shelf. I don't think number of subscriptions matters so much as a slow trickle of magazines to many venues meaning magazines taking up shelf space. People get the magazine and are informed of the myriad and convenient ways to get it next time. Simplify the process: for the writers guidelines, calling it lulu print option is just being up front so if someone automatically thinks that's bad, well they can surf elsewhere. but for the consumer, what the hell is Lulu? I'd line up three neat buttons in a row: Print Edition, PDF, and Kindle/Mobi. If there are ways to incorporate this more into the site so customers are not taken to a diff site, then that would be good. 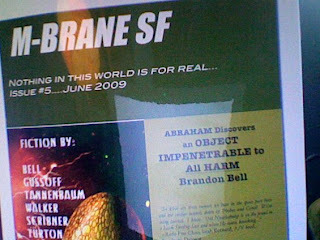 Get someone to create a M-Brane SF iPhone app. Buy it for $15 buck and you get a year's subscription on your iphone. Same for Android (google phones) and the coming Palm Pre. I'm not the guy who knows how to do this, but I bet it wouldn't be hard to find. And in that same vein, take the covers over the top: make me, the potential reader, unnable NOT to pick it up to see what this thing is about. Don't get me wrong, that picture above with that shiny cover makes me gleeful to no end, but I think you've only just begun. Restrict yourself to only so much fiction per issue, perhaps a bit less than you've had per so far, and add in an outsourced column or two. What are the cons that are in your and your writer's locals? Map 'em out, make plans, do drives for both funds along with a nice big M-Brane Banner (and a smaller one for the anthology) and send the 'm-brane representative' there with copies of each issue, the anthology once it is out, and a bunch of enthusiasm. Always have a list for people to jot their contact info on and then use that to send out the monthly new issue notice. Yeah I know what you mean re: the stuff on and off the site. That column of buttons on Page 2 for ordering the various formats needs some work, There's just so much crap on the page (well, on the TWO pages) that I don't know if a re-tool is possible until I manage to get a better site. Selling directly from the site without having to go to Amazon or Lulu for those versions is right out until I have better technology. As for the iPhone app, I believe ones exist already to handle to those ebook formats (Kindle for sure), but I'll need to look into it more. It would be cool to have something custom for it, though. The Mac/iPhone app that I have on my laptop, which is supposed to work, makes the thing virtually unreadable. I need to get hold of one of these devices someday so I can mess around with it myself. I have yet to see in person an iPhone or a Kindle or a Sony reader and have so far just been taking people's words for it that the ebooks work fine on those.